Everybody wants to be different. From the things we like to the clothes we wear, everything about us makes us who we are. Sure, you’ve never thought of your wallet as an extension of your personality. You use it to store your money and cards, but don’t put a lot of thought into it after that. But the right wallet can add even more definition to your personality. That’s why we have taken a look at some of the most unique wallets for men out there. Each of these unique wallets for men offers something different from the norm and will look great whenever you pull it out. You don’t often look at carbon fiber as a good material for wallets. If anything, it seems better for bicycles and other items that can take advantage of its sturdy nature. Butthat sturdiness is exactly why carbon fiber works so well in wallet design. The rugged shell of the wallet is five times stronger than steel while having the flexibility needed to feel comfortable in your pocket. The wallet also looks the part. The slim design hides the wallet’s ability to store lots of cards. Beyond that, a carbon fiber wallet looks nothing like the regular wallets you see lining the shelves in shops. That makes it one of the most unique wallets for men around. You can use your wallet to show people what you’re passionate about. A Star Wars themed wallet highlights your enthusiasm for George Lucas’ flagship franchise, while a Sonic the Hedgehog wallet is a firm favorite of SEGA fans. Lots of companies produce themed wallets and they’re some of the most unique wallets for men around. That uniqueness tends to come from the design, rather than the features the wallet has. Once you open them up, you’ll find that most have the slots and compartments for your change and cards. Still, they look the part and can even match up with your clothing. Pulling your Star Wars wallet out while wearing a franchise-themed t-shirt will set you apart from the people around you. Keeping track of where you’ve put your passport can be a hassle. It’s a nightmare scenario when you’re preparing for a vacation and can’t find your passport. You end up spending hours looking for it, and you’ll feel insecure about losing it again when you go to the airport. A passport wallet helps you get rid of that stress. While they’re larger than the average wallet, passport wallets have special compartments that you can use to store your passport. That means you’ll always know exactly where your passport is. That’s not all. Your passport is a form of identification (ID). Having a passport wallet allows you to carry this ID around with you at all times, ready to use whenever you need it. 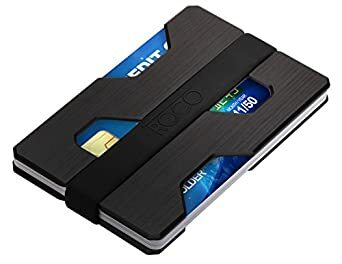 Maybe you’re not looking for a wallet that can hold your money and your cards. Instead, you want something that will protect your cards from the elements and ensure they’re stored safely and will be ready to use whenever you need them. A stainless steel credit card holder can help you. While not a wallet in the traditional sense, these cases come with slim designs and offer ample storage space for your credit cards. The stainless steel design makes them some of the most unique wallets for men. Plus, you won’t have to worry about your cards cracking when they’re encased in steel. You can harken back to your younger years with the NES wallet. It looks just like the control pads you used to play your favorite games so many years ago. Carrying the official Nintendo seal, this wallet sports a rather original look. The buttons all stand out from the wallet and you can press them to feel as if you’re playing an actual console. Unfortunately, these buttons won’t really do anything. Still, it’s something that makes this one of the more unique wallets for men. The only drawback here is that the NES wallet doesn’t have a coin pocket. You can’t use it for change, but the five card slots make up for that. There are many unique wallets for men out there. You just need to take the time to look for them. Each of the wallets we’ve looked at in this list offers something different from the regular wallets you see in most stores. They all stand out and will ensure that people notice you whenever you take your wallet out of your pocket. Howdy I am so glad I found your weblog, I really found you by mistake, while I was researching on Aol for something else, Anyways I am here now and would just like to say thanks a lot for a marvelous post and a all round thrilling blog (I also love the theme/design), I don’t have time to go through it all at the moment but I have saved it and also added in your RSS feeds, so when I have time I will be back to read a great deal more, Please do keep up the fantastic job.